So here's the deal... I'm a sucker for mugs. This has been a long-standing obsession that started on our honeymoon back at the turn of the century (wow - how old does that make us sound?! ), and the collection grew from there. After a few years overseas and a desire to simplify our lives (and cabinets), I began to purge the mugs that meant little or nothing to me, keeping only those that made me smile or--with each sip--transported me to a far away locale or brought a delightful memory to mind. Seemingly unrelated (hang with me), but since the kids arrived last year, our bedroom has become our private sanctuary (much needed for these two INTJs). Bringing five kids into the mix meant that I lost my dedicated office space and our bedroom absorbed my work zone. The long desk space just begged for junk to cover it, and with the aforementioned five children there was always plenty of it to go around. School papers, stuff to file, and miscellaneous paraphernalia were drawn to the desk space like a moth to a flame, and our so-called sanctuary quickly became the collection area for everything that had no home of its own. After 12 months of chaos, I'd had enough! Just before Christmas I made a concerted effort to finally get my office desk cleaned off in order to repurpose/reclaim one half of it as a tea center. While I was busy buying specialty teas and a thermos for the Hub's Christmas, unbeknownst to me, HE was busy buying an electric kettle and two fantastic new mugs for me. Great minds, and all that. His half of the the final outcome included two additions from The Unemployed Philosophers Guild. If you haven't heard of them before, you're probably not alone. Although left-leaning in their merchandise, they do have some bright spots - for example, these beauties with quotes from Sherlock Holmes and Jane Austen. I just can't help but release a deep sigh of contentment while sipping Pomegranate Oolong from a mug that states, "There is nothing more deceptive than an obvious fact" - among other quotes from the mind of Sir Arthur Conan Doyle's great detective. Or this fantastic quip from the timeless Austen, "It is a truth universally acknowledged, that a single man in possession of a good fortune, must be in want of a wife." I was, of course, ecstatic when I unwrapped them on Christmas, but it was a small piece of paper that fell out of them after I removed them from the box that really hit my funny bone. Are mugs new to you? Do you already own a mug? The Unemployed Philosophers Guild cares. For helpful tips that will lead to years of happy and successful mug ownership, watch our instructional video. Finally, the answers I've been looking for on "proper mug utilization" which even covers my specific usage in a room that happens to be both home AND workplace. How convenient is that? Although they don't fall in the No. 1 spot of all-time favorite Christmas gifts, these mugs definitely rank up there in the top 10, and I'm thrilled to have added them to our private collection (who doesn't want a mug that tells you to use the other side for best results?!). 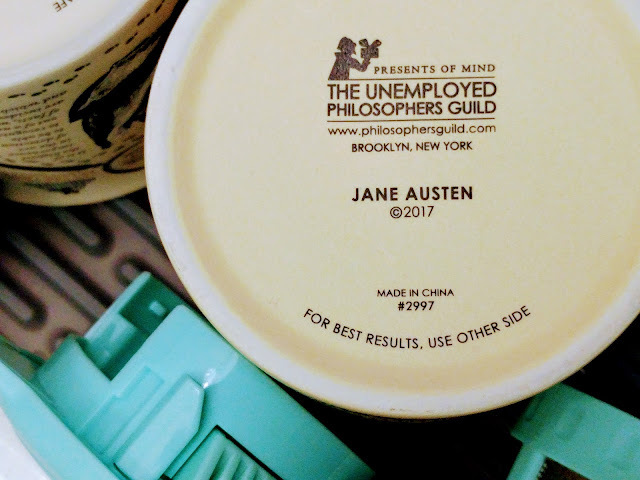 If you're looking for a unique birthday gift for a left-leaning family member, a closet Trekkie, a math nerd, or a Dr. Who fanatic, you're pretty much guaranteed to find something unique at philosophersguild.com.